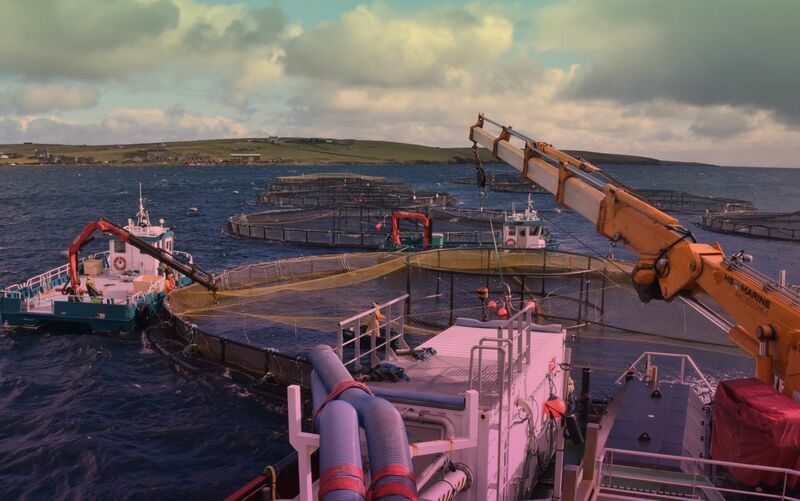 Knowledge Exchange Officer at the Scottish Aquaculture Innovation Centre (SAIC), Sam Houston, recently visited Scottish salmon producer, Cooke Aquaculture Scotland in the Shetland Islands to learn about their methods of sea lice management. Cooke Aquaculture Area Manager, David Brown, hosted a visit on board the Helen Burnie to demonstrate the treatment of fish using a Hydrolicer. Operating since April 2017, this technology was purchased by Cooke as part of their integrated pest management strategy, with assistance from the European Maritime and Fisheries Fund (distributed by Marine Scotland). Cooke Aquaculture is one of several companies participating in a wider project managed by SAIC, supporting the use of new technologies across the Scottish salmon industry. "Sea lice are a considerable threat to farmed Atlantic salmon and represent a significant financial burden to the sector"
What are the traditional and non-medicinal treatments? Sea lice are a considerable threat to farmed Atlantic salmon and represent a significant financial burden to the sector. Sea lice are actively monitored and managed in Scotland and must be maintained at levels less than three adult female sea lice per salmon. If this threshold is reached, the salmon farmer must take action to reduce lice numbers. Traditionally, sea lice have been controlled with medicines, either delivered in the form of in-feed treatments or tarpaulin bath treatments. Whilst these medicinal treatments are still useful, additional methods of lice prevention and removal are being developed, with the industry adopting a suite of new methods to keep lice numbers down. Some of these include: the use of cleaner fish, various types of permeable lice skirts and mechanical lice removal, such as the Hydrolicer, used by Cooke Aquaculture. How does the Hydrolicer work? The Hydrolicer is a machine that has been designed to delouse using low pressure water jets creating turbulence in treatment chambers that dislodge lice from the salmon. On Cooke’s vessel, the fish are drawn into the device through two lines by live fish pumps. Each system line includes a fish counter, two Hydrolicer combi units, the fish pump, water separating units and a filtration system to ensure that all the lice can be removed from the water and destroyed, to ensure no re-infection. Treatments involve careful planning and experienced staff to ensure the salmon are handled as safely as possible. Salmon enter the system from their pen and are counted to provide the operator with feedback. Salmon then pass through two Hydrolicer combi units in series where water jets remove sea lice from the salmon’s body. To remove the lice from the water, the fish pass over a water separator before being returned to the cage. The water is filtered so that the lice can be removed and destroyed. The Helen Burnie has two lines allowing the treatment of up to 80 tonnes of salmon per hour. The Hydrolicer system was developed by Frank Øren and Odd Einar Grøntvedt in a collaborative project between Marine Harvest ASA and Cflow, a fish handling systems company. The first prototypes were tested in 2015 and the technology has developed rapidly, with sixth generation models already available for sale. Although the Hydrolicer is owned by Cooke, the company is willing to hire it out to neighbouring companies, including Scottish Sea Farms, Grieg and Dawnfresh, by charging a day rate for use of the Helen Burnie and gear. David Brown commented: “The Hydrolicer is a valuable asset to us to control sea lice; it is our preferred mechanical treatment in Scotland and has reduced the lice burden at our sites. Due to removal of lice from the environment, we feel that the system gives us the best possible treatment and it also avoids reinfection on the site”. Cooke has already seen the benefits of the system and is keen to invest further in the technology. With thanks to the Scottish Aquaculture Innovation Centre & Cooke Aquaculture Scotland, in particular David Brown, Andrei Bordeianu, Lucas, Neil and Glen.